Being diagnosed with a chronic illness is nothing short of life changing, that’s something I know firsthand. It took 10 years to be properly diagnosed, never being able to figure out why it was so difficult to work some jobs. My son was very young and there were so many things I enjoyed doing with him that I could no longer do. For many years, those living with multiple sclerosis faced an uncertain future. Today, while there is still much unknown about the disease and no known cure, patients receiving a diagnosis can have hope that proper treatment can mean management of their disease. But patients battling diseases like MS and other chronic illnesses need access to the most appropriate medication for their symptoms, as determined between the patient and their doctor. In 1995 there were only two disease-modifying drugs. I started out with Avonex, which gave me a fever and headaches. As my multiple sclerosis progressed and more medications were developed, I changed medications. I feel very lucky that I did not face any step barriers. What has happened to many others, here in New York and across the country is called step therapy or fail first. Patients are forced to take and fail on medications other than what their doctor has prescribed. When a patient is forced through step therapy, the medical expertise of a patient’s doctor is put aside in favor of cost savings. Some patients are forced to fail multiple times on medications that their doctor knows isn’t best for them. In some cases, we’ve heard of people who actually have seen their conditions worsen as a result of step therapy. That is why so many New Yorkers are coming together from Utica to Albany, from Buffalo to Manhattan to ask our lawmakers to support legislation that will help to ease some of the access to medication issues patients are currently experiencing. 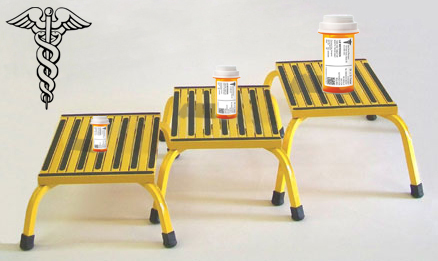 A.2384B/S.3419B would put parameters around the step therapy process as implemented by insurance companies. The bill doesn’t ban the use of step therapy protocols by insurers, but it does give doctors and patients a better, more transparent way to appeal the process when medically necessary. Insurers have tried to say that the number of patients and drug classes impacted by step therapy is small. But, all one needs to do is look at the number and diversity of the supporting organizations that are rallying around this legislation. More than 60 patient and provider organizations from around the state are supporting A.2384A/S.3419. Sadly, it’s because patients with a number of diseases including auto-immune diseases, cancer, HIV/AIDs and mental health disorders all potentially face step therapy with each prescription given to them by their doctor. I urge our local lawmakers and those from across the state to get on the side of patients, and help us pass step therapy reform in New York in 2016. Our health depends on it. Lisa Ostrander lives in Oriskany.